Talk: Honduras: Attacks on LGBTQ & Unions; Rising Resistance Front! Three years after the Honduras coup, Indigenous, LGBTQ, Teachers, Labor and Farmers are subjected to continual violence. The Resistance Front calls for greater international solidarity to stop the violence. This is Chuck Kaufman's final stop on a NW tour speaking on this issue, Evergreen masters student Caitlin Payne Roberts will give a recap of her experience doing solidarity work in Honduras and the delegation trip she took with Chuck and introducing both will be Bruce Wilkinson. On June 28, 2009, democratically elected Honduran President Manuel Zelaya was rousted from his bed by the military and flown into exile. Under the coup government, and the illegitimate government of Porfirio Lobo, �selected in sham elections,� violence and repression against the people of Honduras has continued to grow. � More than 55 small farmers, members of cooperatives farming land they are entitled to under the country�s land reform laws, have been murdered by government forces and �security guards� of large landowners. � Thirty LGBTQ activists have been murdered, many of them tortured and mutilated first. � African-descended Garifuna people on Honduras� Caribbean Coast are being violently evicted to make way for tourism projects. � In May, four indigenous Miskito people, including two pregnant women, a 14-year old boy and a 21-year old youth were wrongfully slaughtered when a US helicopter with DEA agents aboard, negligently fired at Miskito families in a community boat. Four other indigenous family members of the boat were badly wounded. Six of the sixteen persons on the boat were children. The US government trains and funds the Honduran military and corrupt police. It was the primary force behind recognizing the coup government and returning Honduras to membership in the Organization of American States. Join Chuck Kaufman who has traveled to Honduras frequently since the coup to learn about the violence against marginalized communities there, how they are fighting for their economic and civil rights, and what you can do to help. 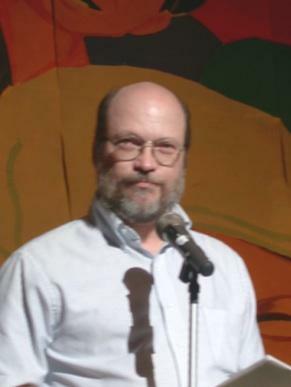 Chuck Kaufman is National Co-Coordinator of The Alliance for Global Justice with 25 years of Latin America solidarity work and anti-war, anti-US militarism work in the US. He has led three delegations to Honduras since the coup.